NEBOSH & IOSH are the one of the world’s most recognized safety qualification awarding bodies where NIST institute for safety training has been providing the certification courses of these two awarding bodies with two more international certifiers CIEH and IRCA. 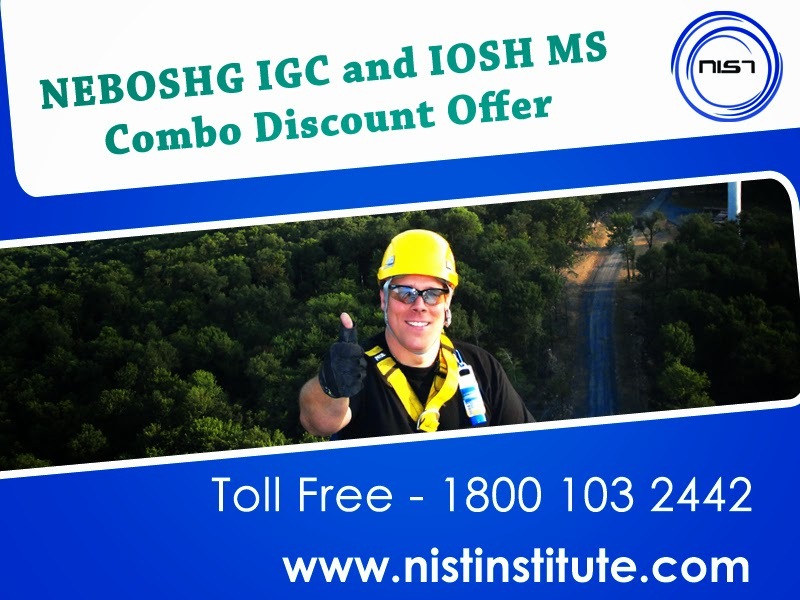 NIST is providing a wonderful opportunity with a doubly qualifying offer of NEBOSH IGC+ IOSH MS in its four different locations. NIST is operating in India, Gulf and Srilanka with many branches and qualified more than 15,000 people for safety standards from past 6 years. The NEBOSH International General Certificate in Occupational Health and Safety is a globally recognized qualification offered by an established independent UK examination board with over 30 years of experience in providing health and safety awards in the UK and across worldwide. The NEBOSH International General certificate provides an exquisite platform in Occupational health and safety in India and abroad, especially in Gulf countries. NEBOSH International General Certificate is a general certification through which you can enter in to any field. This certification is mainly valued in Oil & Gas, Construction and Manufacturing industries. NEBOSH IGC can be divided in to three units where you can learn the management part of how to work safely and why it is important. The workplace hazards, its control measures based on the consequences and how a new suggestion on safety precaution can be given with the inspection activity. As Delhi is acting as a capital educational hub NEBOSH IGC in Delhi is much preferred by various industrial professionals and students from different countries. NEBOSH IGC in Bangalore is pursued by many candidates and the project in this course with the application of safety management system and with workplace controls had helped them in understanding the safety practices practically. Health safety management system for safety is the management system that each and every organization should have with. Even accidents occur or not, it is mandatory to maintain this system for the safety investigation purpose and the company’s future safety. NEBOSH IGC in Vizag endures the practical application knowledge over the safety hazards at the workplace and teaches the principles of health and safety which will help identifying the control measures and to provide safer methods. NEBOSH IGC in Kolkata also receives more attention as Kolkata is the commercial, business and educational hub of eastern India. IOSH is the only chartered body for health and safety professionals in the world which ensures to reach higher occupational and health safety standards and quality through its training courses & memberships. It is a level 2 course provided for manager and supervisors with two different course names as IOSH Managing safely and IOSH working safely respectively. IOSH MS in Bangalore give awareness on what is one’s role in safety. This certification too includes HSMS where it teaches how HSMS can be formed, who should form and how it works. IOSH certification includes a project on risk assessment where the students can learn what all the hazards could have found in a workplace and to identify the control measures for that. IOSH MS in Vizag has so many acceptances as the 200th batch for IOSH is already completed in April of this year with the safety professionals there. IOSH MS helps the mangers to look after their team members and to review their working environment, safety methods and the risk factors to ground an effective health and safety policy. Grab this opportunity to get doubly qualified! How much the total fee cost for this combo pack?